Disease progression states: these are based on international literature and so are not country specific. The national hepatitis programme should be fully costed with the objective to reach the 2020 and 2030 WHO targets. The outcome of this will give countries an overall cost for elimination. The unit costs are multiplied by the frequency/quantity of an activity to arrive at the total annual cost of the activity. The assumptions for each activity will vary in complexity. Areas that you may wish to include as part of this costing exercise are below. The likelihood of falling prices should be considered. Laboratory costs may vary based on whether instruments are purchased or rented. Installation of new machines may require additional investment in infrastructure, including air conditioning. Allowances will need to be made for retreatment. Falling drug prices will be an important issue in some countries. Restrictions on treatment: a study in Scotland has shown that early treatment is more cost-effective than treatment initiated at advanced stages of fibrosis or cirrhosis. Procurement systems for tests and treatment Costs may vary depending on the supply chain selected in countries with parallel supply chains for different types of commodities. Monitoring and evaluation system WHO has a Monitoring and Evaluation framework against which countries will be asked to report and so this is a useful tool to use when determining the indicators to be monitored. Hepatitis surveillance system Integration of hepatitis into existing surveillance systems may be effective. Costs relating to the training of existing healthcare workers around the prevention, treatment and care of viral hepatitis or the recruitment of additional staff have not been included in the above table but it may be useful to undertake a separate costing exercise for this. The World Health Organization (WHO) has set the below elimination targets and countries may want to do the costing with the objective of reaching these targets. 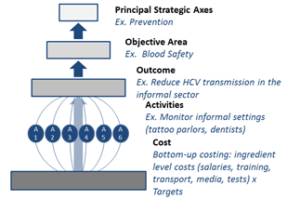 WHO has set out targets for 2020 and 2030 but intermediate targets can be set for each of the hepatitis programme areas to increase the accuracy of annual costing. Each WHO region also has an action plan or framework, agreed by all countries in that region. Some of these contain more ambitious targets than set out in the GHSS and links to these can be found below. A costing tool has been developed to help countries with this process. It follows the “bottom up” approach to costing by breaking down what needs to be costed under each of the cost categories detailed in Table 1. It also breaks down the cost by year to enable you to set annual targets to help reach the overall elimination targets. Areas where costs can be minimised will need to be determined as this will ensure the true cost to the health system is measured. Different ways of minimising costs are noted below. In an environment where, for example, the prices of commodities such as drugs and tests are expected to fall this could be captured by entering different prices to produce a range of overall costs. Conversely, other prices may be expected to increase over time due to inflation. This strategy can also work within a single country if the procurement is currently fragmented or facility driven. Current mechanisms within hepatitis which utilise the concept of pooled procurement at the country level are detailed below. Purpose of the mechanism The fund enables 41 countries and territories in the PAHO region to improve their purchasing power by pooling their resources to procure high-quality vaccines, syringes and related supplies at the lowest price. The fund is open to all PAHO Member States who are able to improve their purchasing power by pooling their resources to procure essential medicines and strategic health supplies at the lowest price. The fund pools orders for medicines and diagnostics from member countries and provides competitive prices through economies of scale, assured quality, and access to more products. How the mechanism works In addition to the price of the vaccine members are charged a 3.5% recapitalisation fee In addition to the price of the medicine members are charged an additional 3% to contribute towards funding the Capital Account and a 1.25% administration fee In addition to the price of the medicines members are charged a mark-up of 5% which is added to the price of the products plus the shipping cost and importation tax. Direct negotiations with suppliers of diagnostics and medicines is a useful tool in securing better prices and so reducing costs. This can be greatly aided by knowing what other countries are paying. Close links between hepatitis programme managers in different countries that facilitate information sharing can be developed during meetings like the World Hepatitis Summit.